We’re now over halfway through the season, and the Penguins are still on the outside looking in. It just seems as though they can’t string more than 2 or 3 wins together to make a legitimate playoff run. That being said, don’t count them out yet. But think about it, this has been the story for the past 3 weeks or so. The Penguins are winning enough games to keep them in the wild card race, but they are not winning stretches of games to really give them a boost in the standings. Most of the teams fighting for the wild card will win 1 of 2, which is basically what the Penguins are doing. Just a few nights ago, the Penguins played arguably their best 60 minute game of the season, dominating the Carolina Hurricanes 5-0. It once again felt like a win that was going to get the Penguins trending upward. They then go to St. Louis the night after to take on the Blues. They did play well the first 2 periods, but the game was tied 2-2 due to a bad play by Zatkoff and due to Ben Lovejoy getting burned by Blues superstar Vladimir Tarasenko. In the 3rd the Penguins seemed to have lost energy and dropped the game 5-2. The Penguins have a chance, but if they’re going to start stringing together some wins, it needs to start now. But they need to at least start some winning stretches: Win 7/8 in 10, put together a 4 game win streak, win 2 back-to-back games, which have absolutely tortured the Penguins this year…If they can do that, then I give them a great chance. But it can’t start in a few games, or next week, or next month…it has to start Thursday night against the Flyers, who the Penguins haven’t beaten in over 2 years. The Penguins have 37 games remaining. Of those 37 remaining, they play 20 (more than 50%) within their own division. This includes a stretch in March where the Penguins play 11 of 13 games against division opponents. They play the Flyers 4 times (have not played them yet this season), Rangers 4 times (have not played them yet this season), Capitals 3 times, Devils 3 times, Islanders 3 times, Hurricanes twice, and Blue Jackets once. In the new playoff format, the top 3 teams in the division have a playoff spot locked, so placing high in the division is extremely important. If the Penguins can find a way to start winning games, they will be beating the teams within their division, and will find themselves climbing the ladder quite quickly. On the contrary, if they continue to play about .500 hockey or worse, especially against the division where the Penguins have performed poorly in the past few years, the Penguins could kick themselves right out of the playoffs and onto the golf course. Just to give you can idea on where the Penguins stand, they are currently 5th in the division with 49 points. No one is going to catch the Capitals, who lead the division by 18 points. But believe it or not, the Penguins could have their eyes set on 2nd if they can buckle down throughout the home stretch. The Rangers are in 2nd place and have 55 points, but the Penguins play them 4 times AND have a game in hand. The Islanders are in 3rd with 54 points and the same amount of GP as the Pens, but the Penguins play them 3 more times. The Devils have 51 points in 4th place, but the Penguins play them 3 more times and have 2 games in hand. The Flyers are in 6th and have 48 points plus a game in hand on the Penguins, but the Penguins play them 4 more times which gives them a great chance to separate themselves from their cross-state rival. The Hurricanes, in 7th, also have 48 points, but the Penguins have 2 games in hand. The Penguins do play the Canes twice more, but I do not see Carolina being a playoff threat. Not yet. They’re still rebuilding. So can the Penguins pull this off? Sid has been on fire as of late. He is scoring goals, making sweet passes, and just looks more confident than he has at any point under Mike Johnston. I think Sid is benefiting from Sullivan’s system, but Sid needs to keep his production trending up to give the Penguins a chance at legitimate playoff contention. Kunitz has also been playing very well as of late. His legs seem to have gotten younger. He is starting to score goals again, and looks much more like the Chris Kunitz of a few years ago. Hopefully those legs can stay young, because the Penguins are going to need a guy like him to keep producing at a decent clip, especially playing with Sid. Kessel has great play-making ability, and I do not want to take that away from him, but the Penguins traded for him to be a goal scorer. Period. I still believe in Kessel, but he just needs to find some confidence and start shooting the puck relentlessly. The guy has a wicked shot. Derrick Pouliot, high-end defensive prospect for the Penguins, was called up recently due to the unfortunate injury of David Warsofsky in the game against Carolina. Pouliot played a bit last year, and more often than not, was not living up to expectations. That being said, he has been fantastic in the AHL and deserves to play. I would personally scratch Ian Cole, who has been way underperforming, and give Pouliot his shot. He should help the defense get involved and possibly quarterback the 2nd powerplay unit. For those of you that were not aware, the Penguins traded away David Perron and Adam Cledening to acquire the speedy Carl Hagelin from the Ducks. I like the trade and I like what Hagelin can bring. He fits much better in the Eastern Conference, as he is a small, fast forward who is a great back-checker and PK guy. That being said, he can score goals. He scored 17 with the Rangers not too long ago. He is currently on a line with Evgeni Malkin, but I wouldn’t be surprised if he has a chance to play with Sid. Hagelin looked good in his first 2 games despte not even being able to practice with the team, but I think he needs to step up and chip in 10 goals the rest of the way. 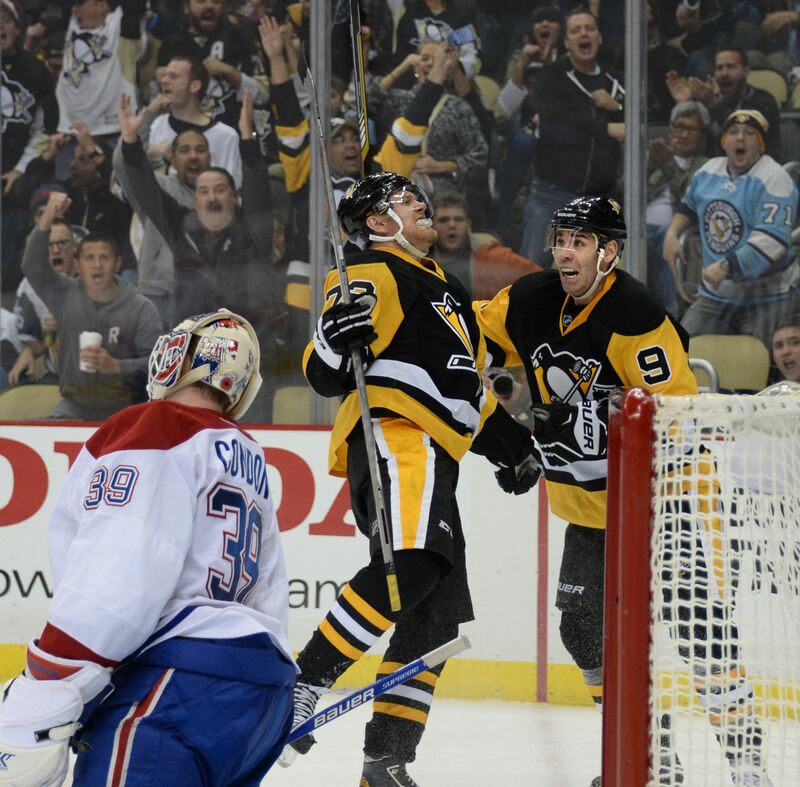 Last night, the Penguins beat the best team in the NHL, the Montreal Canadiens, 4-3 in a shootout. The Canadiens were without all-star goalie Carey Price, but backup goalie Mike Condon has been spectacular in his absence. What is the more impressive thing about this win? For the first time since January 5th of 2014, the Penguins won a hockey game when trailing after 2 periods of play. Before last night, the Penguins were 0-31-6 in their last 37 games when trailing after 2 periods. Well, make that 1-31-6 in their last 38, and the first win when down after 2 under Mike Johnston. It’s nice to get that monkey off the back, but it can’t stop there. One down, but plenty more to go. If the Penguins plan on making a playoff run, or, dare I say it, win a Stanley Cup, this record needs to keep improving. I understand the Penguins cannot win every game when they’re losing after 2 periods. Heck, they won’t win the majority of them. But they need to be a team that is able to come back in games and be a third period threat, especially considering how good the Penguins’ offense is. Ideally, they should be winning 20-30% of these games, which would be easily top 10 in the NHL. They did it under Bylsma with a less potent offense, and so there is no reason that they cannot win 20-30% of those games with Crosby, Malkin, Kessel, Hornqvist, Sprong, and company. Let’s just hope this is the start of a Penguins team that shows some resilience and starts to win more of these types of games. It took the Pens just 13 seconds to get on the board. Beau Bennett carried the puck into the zone along the left side of the ice and dropped a pass to Dupuis while getting pressured. Dupuis sent a pass around the back of the net that ended up on the stick of Crosby on the other side of the ice. Dupuis followed his pass, drove straight to the net, and deflected in a pass from Crosby to give the Pens an early lead. Just about 3 minutes into the period, Phil Kessel walked out in front of the net and put a shot on goal. Condon made the save, but Kessel found his own rebound and put on another shot on goal. It was a great chance, but Condon denied it. Plekanec had the puck down low on the power play and swung a pass up to PK Subban. Subban then fed a pass that was put on a platter for Markov who blasted one home past Fleury to tie the game. The puck just snuck through Fleury’s armpit area, and Fleury should have stopped it, but it did look like the shot was deflected slightly by something in front. 10 minutes into the period, Hornqvist had a great opportunity. Nick Bonino had the puck behind the goal in the offensive zone and found a wide open Hornqvist just a few feet in front of Condon. Hornqvist got a good shot off, but Condon stood tall and kept the game tied. With about 7 minutes left in the period, the Penguins were on the power play. Kessel put a shot on goal that was partially blocked, but found Malkin behind the defense who put a quick low shot on Condon. Unfortunately, once again, Condon was ready for it. This goal originally looked like it was Kessel’s, but upon further review, the goal went to Maatta. Maatta carried the puck into the offensive zone in a 3 on 2 situation. He dropped a pass off to Kessel and immediately drove to the net. Kessel then ripped a quick wrist shot on goal that deflected off of Maatta and past Condon to give the Pens the lead. Both goals for the Pens came in the first minute and last minute of the period respectively. 6 minutes in, Crosby made a very bad blind behind the back pass that turned into a odd man rush for the Canadiens. Eller came up the left wing with the puck, gave a pass to Galchenyuk, who one touched a pass right back to Eller who put a quick one-timer on Fleury, but Fleury denied it. Pacioretty had the puck in the defensive zone, and noticed that 2 of his guys were up the ice behind the Penguins defense. He flipped a weak backhand pass that squirted through the skates of Ian Cole, and turned into a 2 on 0 rush. Gallagher did not need to other man however, as he fired the puck past Fleury’s glove side. Cole needed to stop that puck, even if it meant going down to a knee or whatever. He had 2 opposing players behind him, and he cannot let that happen. Torrey Mitchell had the puck in the neutral zone. He passed the puck to Matt Flynn who was absolutely flying into the offensive zone. He came down the right side and put a shot on Fleury that snuck right between his right arm and his body and found the back of the net. This was a tough goal for Fleury to give up, and one that he normally stops. The Habs outshot the Penguins 13-1 in the period, and the Penguins one shot was actually an attempted pass that ended up being on goal. It was a rough period for the Pens, and a comeback seemed unlikely, especially with their recent history in that department. 4 minutes into the period, Kessel nearly tied the game. Malkin found Kessel streaking up the ice and was in a one on one with Markov. He made a slick move around Markov, deking forehand to backhand, but Condon made the stop once again. It was a huge save. With just 8 minutes to go, Kunitz was behind the net in the offensive zone, skated to the front, and let a quick low wrist shot go. Condon made a save, but the puck found the stick on Bonino. He beat Condon, but did not beat the post, and the Habs maintained their lead. This play happened because Sidney Crosby is Sidney Crosby. Letang had the puck in the Penguins zone and fired a puck off the boards to get the puck out. The puck came to Crosby with some speed, who deflected the puck with his skate/stick to an in-flight Patric Hornqvist, who skated the puck into the zone and went thin mints on Condon to tie the game at 3. The pass by Crosby was absolutely ridiculous. The Penguins had a power play for basically the last 2 minutes of regulation, but they were not able to capitalize. This game needed extra time. Once again, the Penguins had a power play chance in what was basically the last 2 minutes of overtime. Except this one was a 4 on 3. Kessel had the puck in the zone, skated it to the right circle, and fired a low shot on Condon. The shot was saved, and the rebound came to the stick on Kris Letang, who beat Condon, but did not beat the post behind him. This must have been the same post Zatkoff used to help him in his last outing. Perron also hit it earlier in the game, as did Bonino. The Penguins, as the home team, elected to “defer” and let the Habs shoot first. Galchenyuk came in on Fleury and looked like he wanted to pull off a backhand deke, but he came in too close, and Fleury got him with the poke-check. David Perron with his vintage move. He skates up the left side of the ice moving ever so slightly to his right. He fakes a wrist shot and goes backhand. It sure worked for him this time. Desharnais made an interesting move, as he faked a shot by waving his stick over the puck. Fleury fell to his side reaching out for the poke-check. Although he missed, Desharnais could not beat the sprawling Fleury. Crosby skated in slow on Condon, and simply just out-deked him. He faked out Condon, went backhand, and beat him to give the Penguins the win in the shootout. Although Ian Cole looked good last year, he has been looking anything but good for the Pens this year. Him and Letang are currently 2 of the worst 3 defensemen in the NHL in plus/minus, and it is not a coincidence that him and Letang are paired together. I never understoood this pairing to be honest. Cole is a good bottom 6 guy, but he should not be logging Kris Letang type minutes. In addition, these 2 have not looked good as a pair. At all. Letang even admitted that he feels as though he and Cole are never quite on the same page, which is a cause of concern. For the third period, Johnston FINALLY put Cole with Scuderi on the bottom pair and reunited Maatta and Letang. It’s about time. Although I would like these 2 to stay together, Johnston says that they will see more time together in games, but they will not be a lock for a defensive pair. Why? Because Maatta is apparently not in good enough shape after his rough offseason to log minutes with Kris Letang, who leads the Pens in ice time. Let’s hope they put Maatta with Letang for the majority of the time, also considering that both Maatta and Letang had new life after being put together as a defensive pair. Everyone needs to chill out about Crosby. He had 2 assists tonight, and looked absolutely fantastic. Yeah, his game isn’t perfect, and he can make some adjustments, but he is Sidney Crosby for crying out loud. He is going to be fine, just watch. In the words of Evgeni Malkin, relax. Scary moment for Fleury in this game. He took a stick to the face that went through his mask. 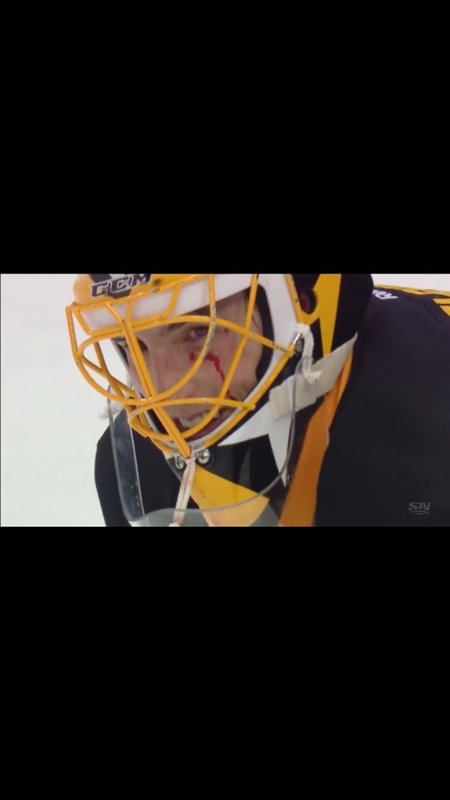 Fleury said he lost sight in his one eye for a few seconds, but he ended up okay. He went and got stitches in the cut right above his eye, but he ended up okay. As always, Fleury is all smiles, even with the cut below his left eye. Thanks, as always, to those who keep up with me! I want to start writing more posts/blogs not necessarily related to game action, but rather just about my opinions on some stuff every once in a while, so I will try to get that going as the season goes on. The Penguins go from playing the best to the worst, as they face the Columbus Blue Jackets tomorrow at 7. Any one else getting super hyped for Thursday? It really started to hit me today that the Penguins play a REGULAR SEASON game this Thursday. Can’t wait. Anyways, let’s delve into the 4th article in 4 days: this year versus last year. Jim Rutherford made some bold moves in the offseason. He traded Brandon Sutter for Clendening and Bonino, he traded a bunch of prospects for Kessel. He acquired Fehr, Cullen, and Plotnikov via free agency. This guy is not messing around. He wants a Stanley Cup back in Pittsburgh. However, we must also note the Penguins lost plenty of talented players in the offseason. They lost blue-liners Paul Martin and Christian Ehrhoff, they lost bruiser Steve Downie, and they lost Blake Comeau, who showed a lot of success with the Penguins…just to name a few. Below is last years Penguins opening night roster. Not terribly too much has changed here. The main difference is that Kessel is on a line with Crosby and Kunitz rather than Hornqvist. Hornqvist is a great player, but Kessel is an elite sniper. “Crosby to Kessel” should be a popular phrase this season. This line definitely upgraded, although not as much as others believe it or not. Well, Malkin is a constant on this line, but his wingers have once again changed. Comeau is gone, but he is replaced with Sergei Plotnikov, who I think can do just as much, if not more damage, than Comeau did with Malkin. Additionally, Hornqvist, who played on the first line last year, will get to see some time with Malkin. Hornqvist is definitely an upgrade to Dupuis on this line, even though Duper is a terrific hockey player. This line also has clearly upgraded from last year. Okay, this line got a HUGE upgrade. Downie was a solid player for the Penguins, but he took way too many penalties to be legitimately effective. Sutter was also very strong for the Penguins, but Bonino, who replaces Sutter this year, has better upside offensively and better possession numbers. And Perron vs. Spaling?! Yeah, I’ll take Perron on that one. Huge upgrade for the 3rd line. Ha ha. Ha. Do I need to even analyze this one? Sill, Goc, and Adams were all a complete joke. Yeah sure, Adams and/or Goc could kill a penalty or 2. But does another team even feel somewhat worried if that line was out on the ice? I wouldn’t be. On the other hand, Bennet and Sprong but had fantastic preseasons, scoring 3 goals each. Both have looked great, and Bennett looks as good as he ever has. If he stays healthy (knock on wood), he may have a breakout season, even if he is on the fourth line. Cullen will put up decent numbers as well, but not anything special…then again, he will probably put up as many (if not more) points and Sill, Goc, and Adams did all of last year, because it wasn’t many. Rutherford really put some focus in the bottom 6 forwards and he did his job well. The Penguins are rolling with 4 lines that can score. Even if the Rangers put Staal and McDonagh against Crosby’s line, the Penguins have 3 other lines that know how to score goals. It should be fun to watch. If you noticed, I have Letang with Maatta to start this year rather than Letang with Scuderi, which I put in my article I posted yesterday. I did not think they would start the season together, but Mike Johnston has come out since then to say that they will start the season as the top pair. I do not necessarily agree, but let’s go with it. I see this comparison as a washout. Letang is still Letang, and Maatta is upcoming. He might not have Paul Martin’s experience, but he has the hockey smarts, and I think him and Letang should blend well. Well, we hit our first bump in the road. I think the Penguins had a better 2nd D pair last year than they do this year. Cole and Dumoulin have played well together during the preseason, but both of these guys are seen as “bottom 6” kind of guys. They would really need to step it up to be considered a top 4 pairing. On the other hand, I do see Ehrhoff – Maatta as a top 4 pairing, so the Pens downgraded here. Oh. That was awkward. Scuderi is the constant, and the change between Lovejoy and Despres was due to the trade of these players, straight up. I don’t mind that the Penguins traded Despres for Lovejoy, but they should have got more value back for Despres, who is only in his 20’s and has decent potential. Therefore, based off of that, I would say the Pens downgraded just slightly on their third D pair. Overall, the defense downgraded. However, Rutherford decided he wanted to let some of the young guys play. We will just have to see how things work out. On a side note, regarding defense, I have heard rumors circulating that Rutherford wants Dustin Byfuglien… but it is way too early to talk about trade rumors. We can discuss that later if it really becomes something that is legitimate. That being said, don’t be surprised if GM Jim Rutherford goes after a top 4 defenseman, because that is one of the only spots where the Penguins are really lacking right now. Overall, considering everything, the lineup definitely improved. The defense did downgrade, but the upgrade of the offense way overpowers the losses on the blue line. If the Penguins want to be successful, they need to learn how to score goals, and win the high scoring hockey games. That is how this team is built, and it is how they should play. Once again, thanks to those that keep up with my blog! Tomorrow (or technically, later today) I’ll be writing an article regarding the NL Central vs. the Metropolitan Division. It should be a good one.